We’ve previously lived as expats in Thailand, and are seriously considering another expat adventure, but because we want to be in close proximity to our family and friends in the U.S., we’re looking at Central American locations. Earlier this year I took my second trip to Belize—having previously scouted out Ambergris Caye two years ago—and had a hard look at what one could really expect if he/she lived in San Pedro on the Caribbean island of Ambergris Caye or Placencia, a beach town in southern Belize. Walking on the golden sand, gazing at the calm Caribbean Sea, you just feel your Type A personality disappear and Type B takes over. I did this every morning, sometimes stopping along the way to take my coffee, and felt totally relaxed and content. That’s the joy of Belize. The expats I met in both places told me they spend their time walking the beach, reading, socializing, volunteering, and of course, participating in the wide range of activities available to tourists: fishing, diving, snorkeling, boating, swimming, hiking the Maya ruins, and side trips to other Central American countries. There’s plenty to do on Ambergris Caye. While we were there, we had some great lunches, dropped in at the dinner hot spots of San Pedro, and even went wine tasting as we toured around in one of the island’s ubiquitous golf carts. Because there is sea grass along the shore—meaning that it is not feasible just to go from the beach into the water—paddling is not the main attraction here. Instead, you have to go out past the sea grass via boat or dive off the docks. As the local divers told me, this is a good thing as the sea grass provides nutrients for the sea life, which greatly enhances the world-class diving experience. Don’t worry if you don’t know how to dive though. In our free time, we were introduced to SNUBA, a water sport that combines snorkeling and scuba diving—and in the process even got to rub a shark’s belly! Air is supplied by a tank floating on a small raft on the water surface, rather than on the diver’s back. You descend 20 feet or so, and simulate the diving experience without the time & expense of certification. Only 30 minutes of training and you are jetted off to the Belize Barrier Reef, the second largest in the world. So how does it compare to Placencia? Well, the cost of living in Ambergris Caye is somewhat more expensive than Placencia, since everything must be transported to the island by boat or plane. Additionally, Ambergris Caye, and particularly the town of San Pedro, is a hot tourist destination for North Americans in the high season, and businesses are geared to satisfy that demand. Higher prices prevail, and there is heavy traffic with golf carts and taxi vans. An important expense benchmark that I always look at is the COB (Cost of Booze). The local beer “Beliken” is quite reasonable and very good. At most bars it’s $2, and you can buy a case (24 bottles) for $33 in most shops. Contrast that to the price of a Californian wine, which can cost twice or even three times as much on Ambergris Caye as it does back home. That being said, you can find very reasonable places to eat. Our “go to” place while on the island was Crazy Canucks Beach Bar. Every Sunday afternoon they have a major beach party, complete with live bands, a great barbecue, volleyball, and horseshoes. It seems as if everyone hangs out here; expats, part time residents, tourists, and locals. Obviously, it is frequented by a large number of Canadians, who are very friendly party animals. But since English is the primary language in Belize, it’s extremely easy to meet people and develop a social life, both with other expats and locals, wherever you go. Pedro’s Sports Bar in San Pedro also features wonderful pizza, very reasonable drinks, and has large TV screens for sports fans. A very affordable but not overly comfortable bus ride took me to Placencia, and I was ready for a bit of luxury. When I got there, I took a tour of the Roberts Grove Marina, where a number of private boats were moored, plus boats that you can hire for all types of water activities, including taking your group out sailing and landing on a deserted beach for a private barbecue party. One evening every week you can join a party boat that features a live reggae band, and you can drink and dance the night away while sailing around the lagoon. You can also enjoy inexpensive nights on the town if you frequent local establishments. A real treat for dinner was Sweet Mama’s in Placencia, where I enjoyed a large chicken dinner along with two beers for only $10. One night a week, they feature an entertaining floorshow of native Belizeans dancing and singing to the beat of drums. Yoli’s, too, is a great little bar/restaurant jutting out over the water in Placencia, and features live music by local bands. 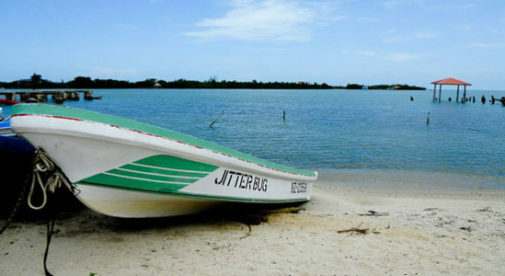 Placencia also has beaches where there is little or no sea grass, and swimming is very pleasant. Though Placencia is small, you’ll find a lot of amenities here, like restaurants and hotels, gift shops and boutiques, and day spas and Thai massage. Expat-owned businesses include coffee shops, including one owned by Keith from Scotland, a gelato parlor, owned by Italian Tizianna, and the Sea Glass Inn, owned by Chicagoans Brad and Christina, who sold everything they owned 18 months ago to buy their dream business here. As mentioned, it’s also more affordable to live in Placencia than in San Pedro, Ambergris Caye. But in both places, you can live very affordably. How much you pay, of course, depends on your lifestyle. First, you must decide if you want to live “large” by buying a nice house, or more modestly by renting a small apartment or condominium. You can live quite comfortably on $20,000 to $25,000 per year after housing costs, including the occasional trip home. Some of the expats I spoke to lived quite happily on that amount including housing costs. An expat could be very happy in either town. If you are an avid diver, then Ambergris Caye is probably a better choice. If you prefer a lower key lifestyle then Placencia could be the place. I do know that if Placencia were my choice, I would include in my budget one weekend a month in San Pedro. A Sunday afternoon spent at Crazy Canucks is a treat not to be missed.